Abuja, Nigeria – The 2018 Second Ordinary Session of the ECOWAS Parliament opened today in Abuja, Nigeria, with various speakers drawing attention to pressing matters affecting the sub-region. A Liberian Embassy release says the opening ceremony of the ECOWAS Parliament was attended by a host of Liberian parliamentarians and officials, including Senators Prince Y. Johnson, and Steve Zargo, Deputy Speaker Prince Moye, Representatives Edwin M. Snowe, Haja Fatta Siryon, Rustolyn S. Dennis, Richard Koon, Clarence Massaquoi, and Ambassador Al-Hassan Conteh. The Speaker of the ECOWAS Parliament, Honorable Moustapha Cisse Lo of Senegal, presented a comprehensive report on the activities and programs of the body since its last meeting, the release adds. In his welcome remarks, the Speaker said the budget of the ECOWAS Parliament was now fully integrated with the financial plan of ECOWAS. He said this the Parliament would review the overall ECOWAS budget for the next Fiscal Year in accordance with the enhanced powers of the Parliament to provide oversight on ECOWAS matters. According to the release, the Speaker’s report covered salient activities of the Parliament, including its visit to Niger to observe recent developments at the International Organization for Migration (IOM) Center in Agadez, Niger, participation of the group in the inauguration of the joint border posts at the Seme-Krake boundary between Nigeria and Benin Republic, and the Noepe-Akanu border between Ghana and Togo. He said the opening of these border posts were high points in the facilitation of regional integration and trade within the sub-region. Also making remarks was the Vice President of the ECOWAS Community Court of Justice (CCJ), Judge Gberi-Be Ouattara of Cote d’Ivoire. He said the Court would lend its support to the Parliament to ensure independent and quality, social justice administration to Community citizens. The Speaker of the National Assembly of Niger, Honorable Ousseini Tinni, who was invited as a special guest, said the quest for greater parliamentary representation should be in consonance with the regional integration vision of the founding fathers of ECOWAS, according to the release. The regional body should go beyond borders and unite the sub-region in attaining the free movement of goods and rights of residence. “We must banish the long queues and harassments at our borders”, he advised. Another urgent matter he alluded to was the promotion of inter-regional trade, which is very low at 25 percent. He said the Parliament must also gear up its efforts at supporting ECOWAS to achieving a single currency to remove convergence costs and integrate the sub-region. Lending support for the ratification of the Africa Continental Free Trade Agreement (AfCFTA) was another area requiring support to integrate the Africa whose 1 billion plus population and 2 trillion USD GDP make its market competitive for the free movement of labor and capital. He requested the ECOWAS Parliament’s support for G5 Sahel countries, which are now actively combating terrorism and migration to ensure peace and security the Sahel region, the release continues. The Second Ordinary Session of the ECOWAS Parliament will continue until December 14, 2018. 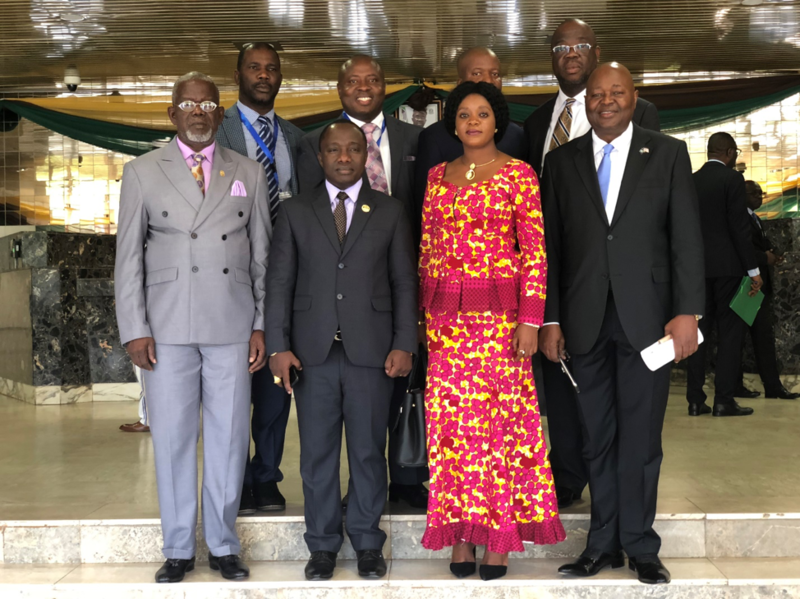 Its working sessions will include country reports, the establishment of an Ad Hoc Committee to consider the draft 2019 ECOWAS budget, among other topics, the Liberian Embassy in Abuja’s release concludes.